Aviation Updates Philippines - Ethiopia's flag carrier, Ethiopian Airlines, launched its flights to the Ninoy Aquino International Airport from Addis Ababa via Bangkok on Thursday, July 9. The Ethiopian carrier now flies three times a week but plans to increase it to daily depending on aircraft deliveries. “We’re very confident that the service between Manila and Addis Abba, we can grow the numbers at a faster rate than what we are seeing in our traditional markets,” Department of Tourism Undersecretary, Benito Bengzon Jr. told reporters at a press conference regarding the start of the new Addis Ababa-Manila route. Ethiopian Airlines flies from Addis Ababa every Tuesdays, Thursdays, and Saturdays utilizing a Boeing 767-300ER aircraft. The aircraft is capable for handling passengers with 220 seats up to 245 seats depending on the seat configuration assigned by the airline. Boeing 767-300 of Ethiopian Airlines preparing for passenger to disembark. “Manila will be our strategic point of access to the Southeast Asian neighboring countries by availing excellent connectivity options. Our flights to Manila will also help strengthen trade and investment ties between Africa and Asia,” Ethiopian Airlines Chief Executive Officer, Tewolde GebreMariam said during the press conference. According to the data given by the Department of Tourism, 5,319 Africans visited the Philippines in 2014, which is less than 1 percent of the country's total number of visitors. 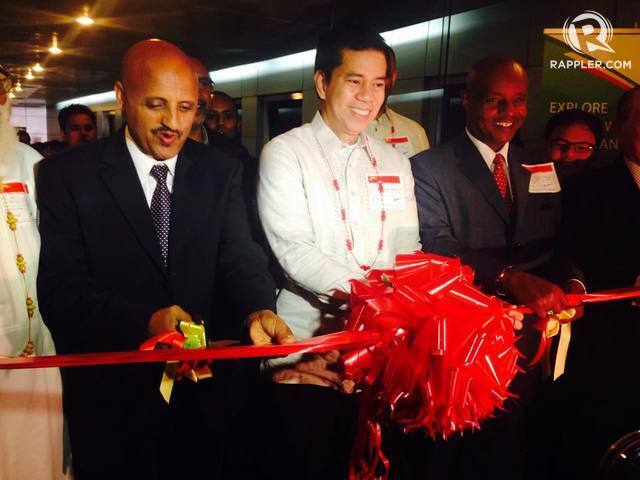 "With this new service between Manila and Addis Ababa, we are hoping to tap new geographic markets. You can grow the numbers from a base of as low as 5,000 to 50,000 in a period of 5 to 10 years," Bengzon said. The airline is now in talks of acquiring new aircraft. GebreMariam said that the airline plans to place orders for Boeing 777-X, Airbus 350-1000 and additional Bombardier Q400 aircraft in order for the airline to expand rapidly in the international sector. "We have 76 aircraft operating, 47 in order. We are evaluating the Boeing 777-X, Airbus A350-1000 and Bombardier Q400,” he said. "The target is to reach 150 fleet by 2025." As of June 2015, Ethiopian Airlines currently operates 5 Boeing 737-700, 11 Boeing 737-800, 3 Boeing 757-200, 7 Boeing 767-300ER, 6 Boeing 777-200LR, 2 Boeing 777-300ER, 13 Boeing 787-8, and 17 Bombardier Dash 8 Q400.